Internationally renowned artist Kimsooja’s videos, performances, and site-specific installations blur the boundaries between aesthetics and transcendent experience through conceptual interventions, meditative practices, and anthropological perspectives. In a public conversation with critic Steven Henry Madoff, the artist will discuss her recent and past works, including "A Needle Woman: Galaxy was a Memory, Earth is a Souvenir" (2014), an iridescent polymer and steel structure standing 46 feet tall, the result of a collaboration with both architect Jaeho Chong and nano scientist Ulrich Wiesner of the Wiesner Nanomaterials Lab at Cornell University under the direction of Stephanie Owens. The event will include Art21’s recently released documentary film on the project, "Kimsooja:Collaboration on Campus—Nanotechnology and Contemporary Art" (2015). Jaeho Chong and Stephanie Owens will offer remarks prior to the conversation. Kimsooja was born in 1957 in Daegu, South Korea, and lives and works in New York, Paris and Seoul. Kimsooja is the recipient of numerous awards that includes; Anonymous Was A Woman Award, 2002, Foundation for Contemporary Arts Award, 2007, John Simon Guggenheim Memorial Foundation Fellowship Award, 2014. Most recently, Ho-Am Prize in 2015 for her life time achievement in the Arts, and Chevalier L’ordre des Arts et Lettre from the French Minister, 2015 for a significant contribution to the enrichment of the French cultural inheritance. She has had major exhibitions at the Centre Pompidou, Metz (2015); Guggenheim, Bilbao (2015); Cornell University (2014); Vancouver Art Gallery (2013); Korean Pavilion at the Venice Biennale (2013); Perez Art Museum, Miami (2012); Los Angeles County Museum of Art (2009); Hirshhorn Museum and Sculpture Garden, Washington, DC (2008); Museo Nacional Centro de Arte Reina Sofía, Madrid (2006); MIT List Visual Arts Center, Cambridge (2005); Museum Kunstpalast (2004); Contemporary Art Museum, Lyon (2003); Kunsthalle Bern (2002); P.S.1/MoMA (2001); Plateau, Samsung Museum of Art, Seoul (2000), among other institutions. Kimsooja has participated in international group exhibitions, including the Venice Biennale (1999, 2001, 2005, 2007, 2013); Busan Biennale (2014, 2002); Gwangju Biennale (2012, 2002,1995); Moscow Biennale (2009); Lodz Biennale (2004); Whitney Biennial (2002); Lyon Biennale (2000); Sao Paulo Biennale (1998); Istanbul Biennale (1997); Manifesta 1 (1995), among others. She has an upcoming solo exhibition at The National Museum of Modern and Contemporary Art, Seoul. Jaeho Chong is an independent New York-based architect working in the field of art and architecture. He is the designer of A Needle Woman: Galaxy was a Memory, Earth is a Souvenir and has worked with Kimsooja on numerous site-specific architectural installations, photographic works, as well as exhibition designs. Prior to founding his firm, he taught at Hong Kong University and practiced at several U.S. architectural firms, including Eisenman Architects, where he was a designer for the Pinerba Condominium in Milan, Italy. He holds a Bachelor of Architecture from the Cooper Union and a Masters of Architecture from Yale University. Stephanie Owens is an interdisciplinary artist, curator and educator. Since 2008, she has been Visiting Assistant Professor in the Department of Art in the College of Architecture, Art and Planning at Cornell University and is currently Director of the Cornell Council for the Arts (CCA). 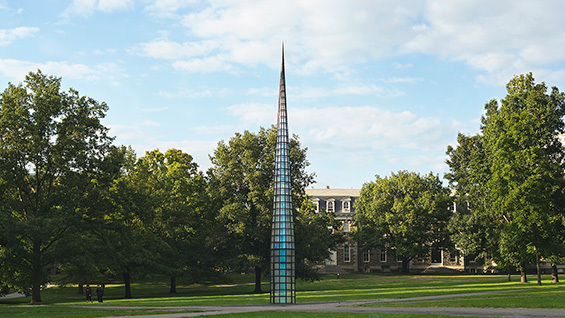 Owens organized Cornell’s first Art Biennial in 2011, creating the university’s first platform for bringing contemporary artists together with pioneering Cornell researchers in science, engineering and humanities. She recently presented papers at SIGGRAPH (Los Angeles); Mutamorphosis Festival (Prague); and Consciousness Reframed: Art, Identity and the Technology of Transformation (Lisbon). Owens received her MFA in Painting from the School of the Art Institute of Chicago and her BFA in Painting from Syracuse University. Steven Henry Madoff is an art critic, curator, and Chair of the MA Curatorial Practice program at the School of Visual Art (where he is also founding faculty of the MFA in Art Practice). He has served as Senior Critic at Yale’s School of Art, is Contributing Editor at Modern Painters and ARTnews magazines, and has written widely for many other publications, including Artforum, the New York Times, and Art in America. His most recent book is Art School (Propositions for the 21st Century) from MIT Press. He is the recipient of various grants and awards, among them from the National Endowment for the Arts and the Academy of American Poets.